Here is Part 2 of our visit to Universal Orlando! Check out my previous posts from our Orlando trip: Epcot, Downtown Disney, Magic Kingdom, Universal Part 1, Legoland Florida, Animal Kingdom, and POP Century. In my Universal Orlando Part 1 post, I covered Universal Studios and The Wizarding World of Harry Potter- Hogsmeade in Universal Islands of Adventure. 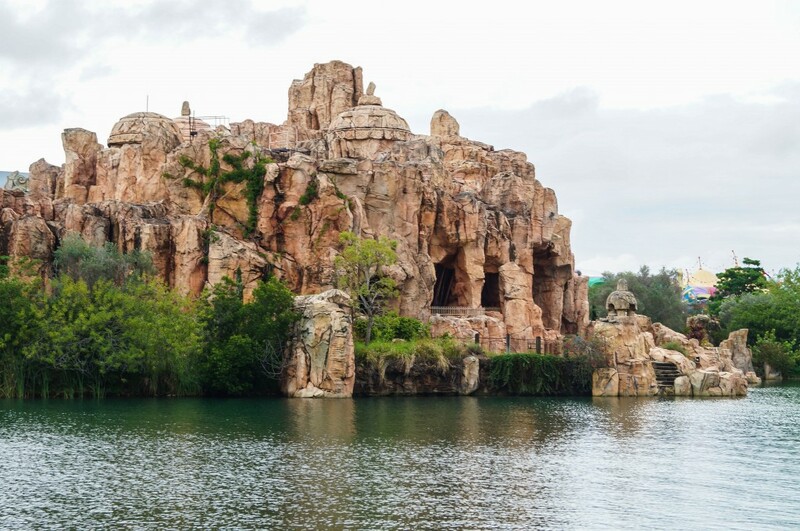 Today, I am recapping the rest of Islands of Adventure. 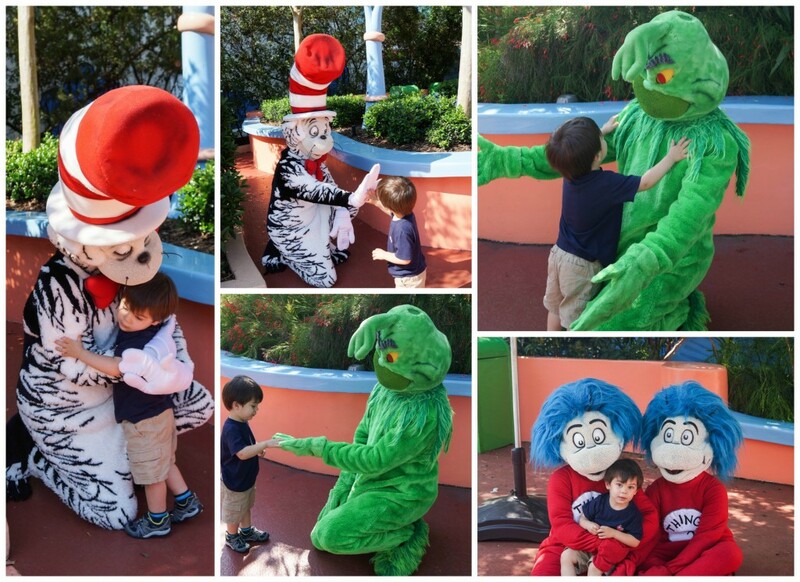 Evan’s favorite area in Islands of Adventure was Seuss Landing. There was so much for him to see and only one ride he did not reach the height requirement for (The High in the Sky Seuss Trolley Train Ride). He especially enjoyed the Caro-Seuss-el, of course, and One Fish, Two Fish, Red Fish, Blue Fish. We were walking by just as the characters came out. 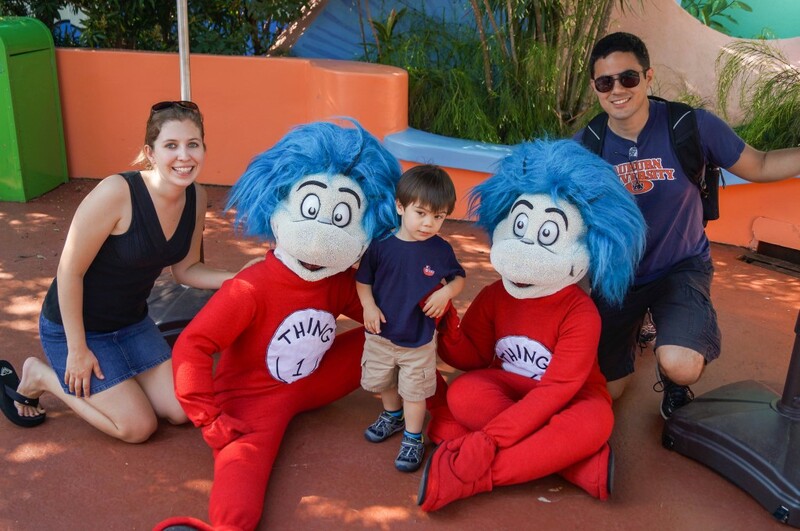 Evan really loved Thing 1 and Thing 2. Thanks to the low crowd level, he was able to spend a good bit of time visiting with them. The only character he refused to visit was Sam-I-am (no idea why). He just kept bypassing Sam-I-am to go back to the others. We went back to Seuss Landing later in the day so Evan could run off some energy. If I Ran the Zoo is splash area that kept Evan happily entertained while Chad and I got the chance to sit for a while. He spent most of the time jumping through the puddles in the moat. For lunch on our first day at Universal, we had reservations for Mythos. Mythos was awarded the best Theme Park restaurant for multiple years in a row (2003-2008) by Theme Park Insider. It is beautifully decorated inside and out and there is something on the menu for everyone, from sandwiches, pasta, and risotto to more gourmet items like Beef Medallions. One thing I enjoyed about Universal more than Disney was how easy it was to plan the details of our trip. For Disney, I had to book dining reservations months in advance to get decent time slots. Same goes for fast passes. At Universal, I used Open Table to book the reservation Mythos a couple of weeks before our trip with no issues. We were seated almost immediately and got a booth right next to a waterfall fountain. This was great in keeping Evan occupied for a bit. Outdoor seating is available as well with great views of the park, but we enjoyed a break from the heat. Chad ordered the Pan Seared Mahi Mahi. 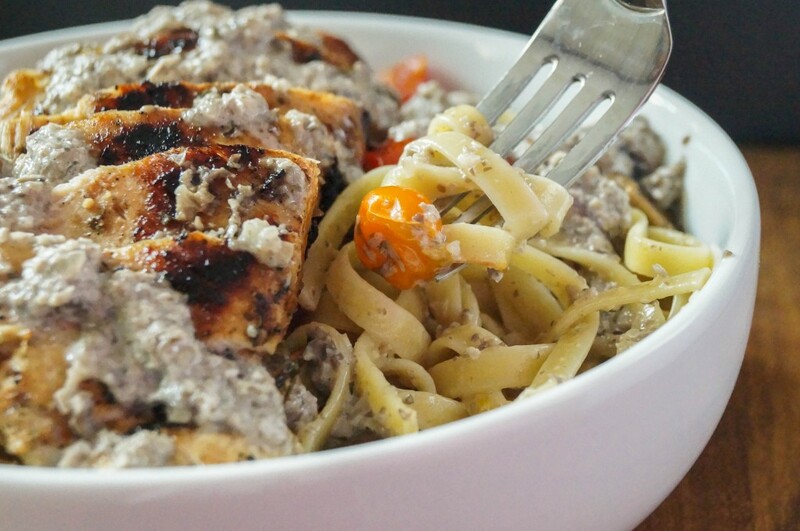 I got the Pasta of the Day- Grilled Chicken over Fettuccine with a Mushroom Cream Sauce. Evan shared from both of our plates. Everything was absolutely delicious. It was also comparable or even less expensive than most of the other restaurants we tried that week. The most expensive menu item (Cedar Planked Bay of Fundy Salmon) is 19.99. Since looking at the updated menu, neither of our dishes are currently available. Evan took a nap in the stroller after lunch, then we spent some time at The Wizarding World of Harry Potter and went back to Seuss Landing. 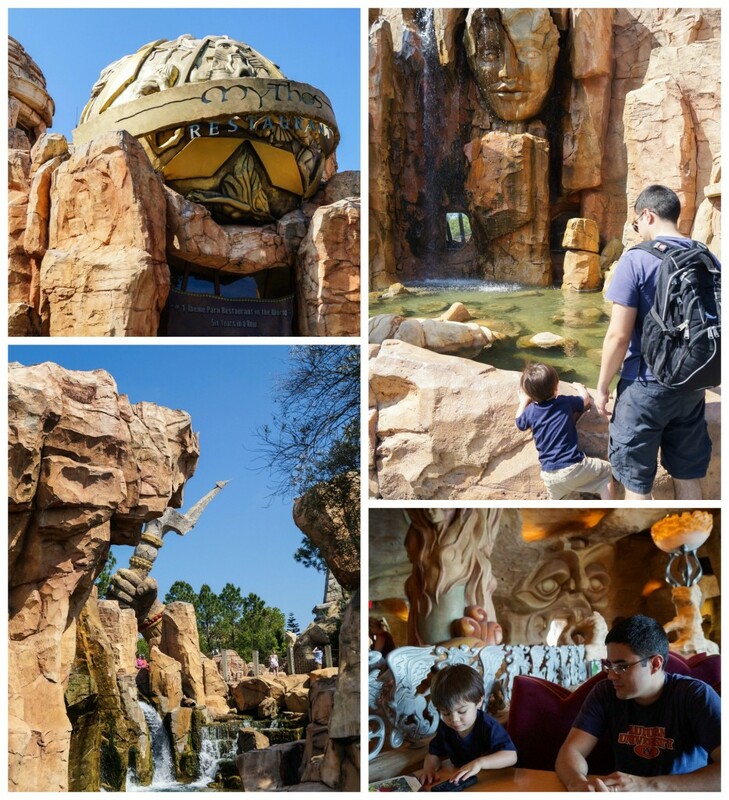 After spending the beginning of our second day at Universal Studios, we went back to Islands of Adventure to check out the other half of the park. 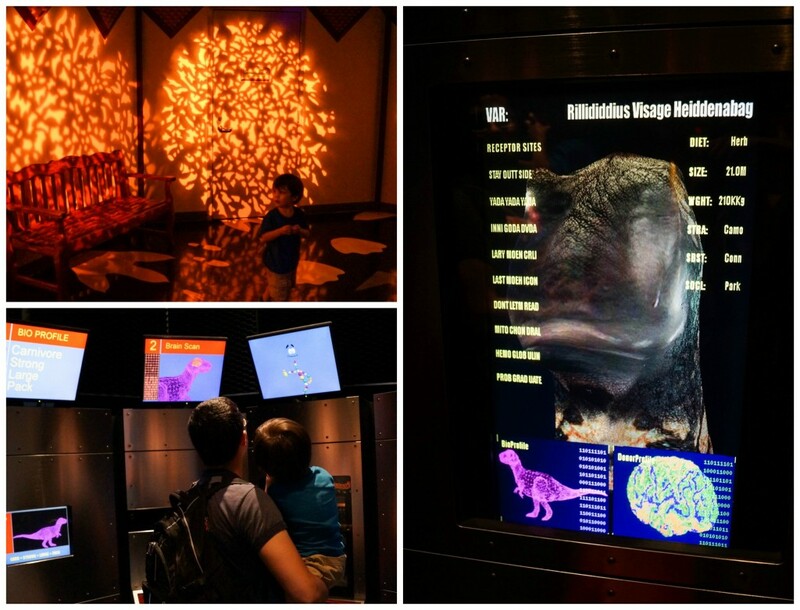 We somehow managed to miss Camp Jurassic, but Evan did enjoy the Jurassic Park Discovery Center. He and Chad spent some time playing on the computers and other interactive exhibits. Evan spent most of the afternoon exploring Me Ship, The Olive in Toon Lagoon. This three story ship had plenty to keep Evan busy. He spent about half the time just going up and down the stairs. There are also a few slides and other interactive playthings. He wasn’t tall enough for the water rides in Toon Lagoon and Chad and I didn’t care enough to use child swap for them. There wasn’t much for Evan to do in Marvel Super Hero Island either, but he did like watching the super heroes in action. On our way out of the park, we stopped by Croissant Moon Bakery for a snack to tide us over until dinner- a ham and cheese croissant sandwich and a vanilla eclair. The same menu options were also available at Beverly Hills Boulangerie in Universal Studios. 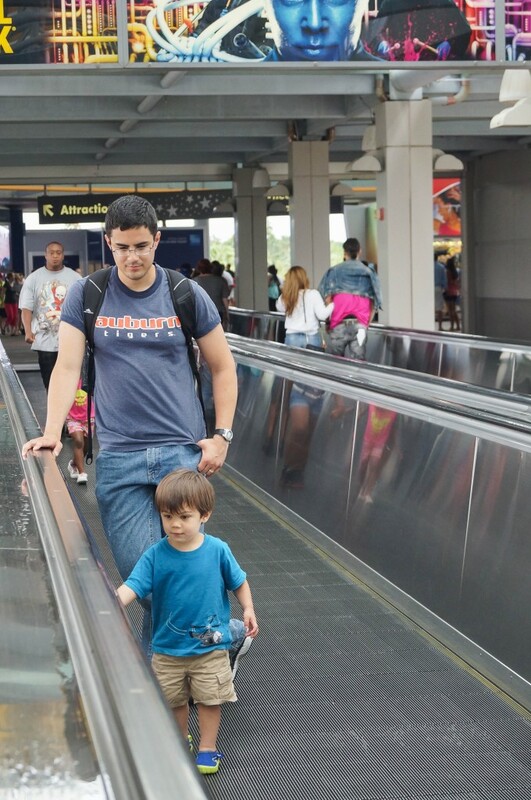 One of Evan’s favorite things about Universal was the moving walkway between the parks and the parking garage. He kept wanting to ride them back and forth. Since my pasta dish at Mythos was so fantastic, I recreated a version at home. I tossed cooked fettuccine with roasted tomatoes, mushrooms, and red onions, then topped it with grilled chicken and a pureed mushroom cream sauce. It was just as wonderful as I remembered. There are a few steps to this dish, but none of them are overly complicated. The biggest thing that can make or break it is the chicken. Grilled chicken can quickly become dry if not prepared correctly. Remove the tenderloins on the back of the breasts and save them for another occasion. I usually make chicken tenders for Evan out of them. Pound the breasts until they are evenly 1/2 inch thick. If the chicken is large, I sometimes cut the breasts in half lengthwise before pounding them. I found this marinade from The Makeshift Nest and love it. Chad cooked the chicken on the grill at about medium high heat just until the internal temperature reached 160 degrees. I let the chicken sit while I prepared the other ingredients before slicing. I usually leave leftovers for Chad’s lunch, but ended up making something else for his lunch the next day and keeping the remaining pasta for myself. It was still delicious reheated. In a medium bowl, combine olive oil, balsamic vinegar, salt, sugar, oregano, parsley, onion powder, garlic powder, black pepper, and red pepper flakes. Remove the tenderloins from the chicken breasts and save for another use. Pound each breast until it is evenly about 1/2 inch thick. If too large, they can be split in half lengthwise. Add the chicken breasts to the bowl, turning to coat. Cover and refrigerate overnight. Preheat oven to 425 degrees F. In a large oven-safe skillet, toss together red onion slices, grape tomatoes, and mushrooms. Drizzle with olive oil and season with salt and pepper. Toss to coat. Bake in preheated oven until the mushrooms have darkened, onions softened, and tomatoes are beginning to release their juices, about 20 minutes. Set the grill to medium- medium high heat (~425 degrees F) and oil the grates. Remove the chicken breasts from the marinade. Place on grill and cook for about 4 minutes per side, until the internal temperature reaches 160 degrees F. Remove to a plate and cover loosely with foil. Bring a large pot of salted water to a boil. Add fettuccine and cook until al dente, just tender. Drain. While the fettuccine cooks, make the sauce. In a medium saucepan, drizzle olive oil over medium heat. Add shallots and cook, stirring often, until softened. Add garlic and cook just until fragrant, about 30 seconds. Stir in the mushrooms, then the rosemary. Cook, stirring occasionally, until mushrooms darken. Pour in the heavy cream. Use an immersion or stand blender to puree until smooth. If too thick, add a little more cream. If a stand mixer was used, return the sauce to the saucepan and place over low heat until heated through. In the emptied large pot, toss the fettuccine with the roasted vegetables, including any liquid. Slice the chicken breasts into strips. 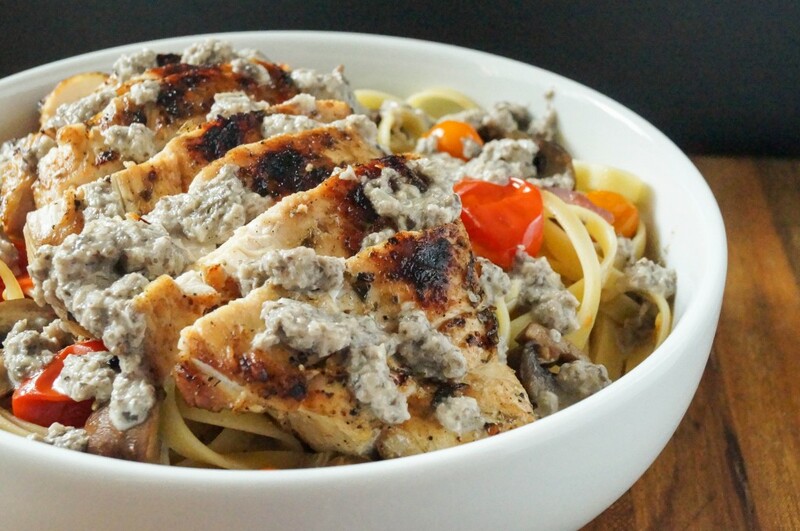 Serve the fettuccine immediately with chicken topped with mushroom cream sauce and parmesan cheese. This looks so good! I love mushrooms with creamy pasta. I will have to try this soon. Glad you enjoyed the grilled chicken recipe! Hope you enjoy it! 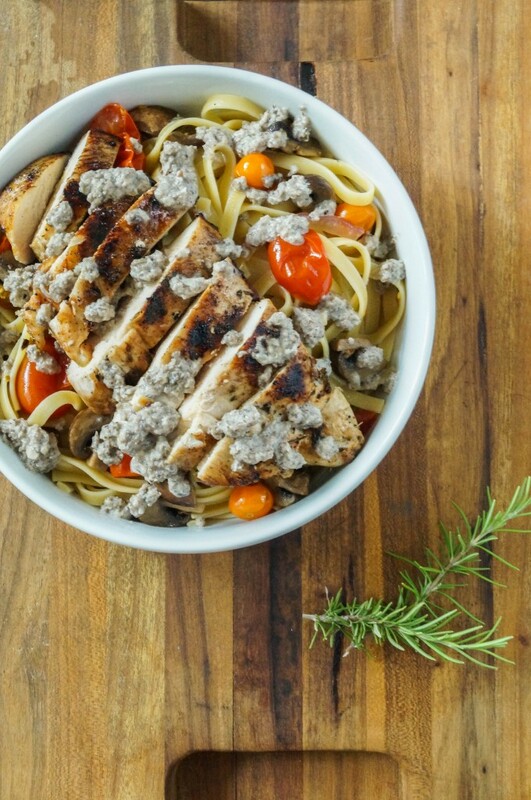 Your chicken worked perfectly with the pasta! I love mythos! Glad you went. And that Evan had fun as Seuss Land. We’ve yet to do anything in that part of the park because my husband refuses. Haha maybe he will have to now with Wesley 🙂 We really hadn’t done much in the other parts of the park before either. I had no idea half the stuff in Seuss and Toon Town existed and still missed a play area in Jurassic.